After spending a month pruning roses, I’m now spending a month shovelling sh**! I’m a very big fan of mulching, especially lately since we’ve been having such terrible droughts in the summer. I’m certain that my deep mulch last spring saved most of my plants from certain death in the 30 degree temperatures and hosepipe bans last July. I didn’t water my garden once – not even the big herbaceous border – and it all pulled through bar one Helianthus (ah… my poor Lemon Queen… still sad about that one). Mulching does such a lot of good. It holds the winter’s rain into the soil. It suppresses weeds for months: I won’t have to weed any of these gardens for a month or so now. And most importantly, if you use well-rotted manure (you can tell it’s well-rotted if it doesn’t smell – and if it’s well-rotted, you shouldn’t get weed seeds) then it feeds your soil all year long. I generally put down another feed – usually pelleted chicken manure – underneath the mulch to give plants a feed right away, since it takes a month to get the mulch moving down into the soil and the chicken manure feeds them in the meantime. 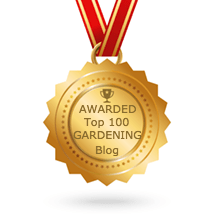 And that’s it – low maintenance gardening that’s good for plants!